At the first Annual Heritage Development Summit, held at the Hyatt Regency McCormack Hotel, on March 15, preservationists, business leaders, homeowners, community organizers, local bank and state government representatives listened to Jerry Adelmann, the executive director of Openland, a conservation organization, talk about the development strategy for becoming a National Heritage Area. 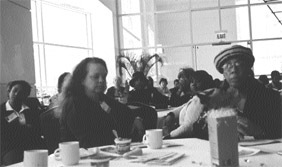 Then the group of people attended several sessions to address the four critical steps needed prior to congressional designation of Black Metropolis into a National Heritage Area. National Park Service guidelines state that four tasks are required in establishing National Heritage Area status. They must first complete a suitability/feasibility study “that can be completed in as few as nine months or three years, and costing as much as $200,000 and as little as nothing if funded by Congress.” The suitability/feasibility study is required to include information on the national significances of its story, data on whether the story is being told elsewhere, how the story can be told and who should be responsible for telling the story and how. The second task would be to incorporate public involvement in the suitability/feasibility study. Third, they must demonstrate widespread public support among heritage area residents for the proposed designation, and attain commitment from key constituents, which may include citizens, area governments, industry and private and nonprofit organizations, in addition to area residents. In the three break-out sessions, the community organizers, historians and others, strategized together to come up with the analysis and documentation to include in the suitability/feasibility study that would illustrate the requirements of NPS standards. In the sessions, they shared the anthropology of Black Metropolis that produced dozens of famous personalities, musicians, entrepreneurs, social justice advocates, literary writers and physicians like Dr. Daniel Hale Williams. Williams performed the first open heart surgery and also founded Provident Hospital, “the first Black-controlled hospital in America,” according to the African American Registry. They talked about the DuSable trails that were established by Jean Baptiste Point du Sable, the founder of Chicago. And they discussed the significance of the nine landmarks in Bronzeville acknowledged by the city of Chicago, historic sites, the age-old churches and present and past entertainment joints like the now-closed Gerri’s Palm Tavern, formerly one of the oldest black-owned businesses in the city, where notable Black entertainers like Ella Fitzgerald and others performed. The participants then shared views about how the area reflects traditions, customs and beliefs that are a valuable part of the Black Metropolis national story. They discussed how the area provides outstanding opportunity to conserve natural, cultural, historic, and/or scenic features, and talked about how the area provided outstanding recreational and educational opportunities, especially for the youths. Afterwards, they discussed with three housing developers, the ways to get the residents, business interests, non-profit organizations and governments within the proposed areas involved in the planning process. During a panel discussion, moderated by Laura Washington, Sun-Times columnist and former publisher of the Chicago Reporter investigative magazine, the summit attendees listened to the developers talk about their public and private housing projects in the Bronzeville Community. They questioned the developers on how they were willing to commit to working in partnership with them to develop the heritage area and asked the developers for their input on ways to continue economic activity in the area. One woman in attendance wanted to know what the developers’ opinions were on the state of African American participation in the construction trade, specifically, whether they felt pessimistic or optimistic about unions in general. Bannister added that his organization was willing to provide jobs for youths in the Black Metropolis and to help them get experience in the construction trade. “We’re willing to work with them. We’re going to insist that they be responsible. We’re going to insist that they have a level of discipline. But we will work with them in that regard. And we try to use resources in and around our buildings to give people experience to help them become educated,” he said. Rev. Dr. Leon Finney, Jr., president of the Woodlawn Community Development Corporation, suggested those in attendance change the way they deal with labor unions so that African American people can have the opportunity to build their own homes in their communities. “Those are our jobs, and it’s bad when you have to hire…white people to come in and build buildings in our neighborhoods and watch young men and young women walking by those jobs every day. That’s devastating to them, to believe that they can’t build in their own community. That they can’t dig a ditch …They can’t lay a brick…They can’t pour concrete in their own community. It’s awful, and we have to do something about it,” he said. Finney also suggested that the group work towards getting City College-run Washburn Trade School, located at 3233 W. 31st St. opened again. There is a lot of African American buying power in the communities and community activist Bobby Johnson wanted to know if any of the developers analyzed the Illinois budget to find out where money from tourism, and other attractions, is going that is supposed to assist the minorities in Illinois. Finney said he and others worked with African American legislators in the general assembly on the state budget last year, and said he would do so again this year. Then he invited those in attendance to work with him regarding the state budget, and encouraged them to support a state tax increase this year. Harold Lucas of the Black Metropolis Convention & Tourism Council wanted to know from Jared Davis, executive vice president of the Neighborhood Rejuvenation Partners/The Davis Group, a real estate development firm, what they intended to do with the landmark Overton Hygienic Building the Davis Group recently bought the building after it came under foreclosure in recent months. The building was formerly being developed by the Mid-South Planning and Development Commission with Empowerment Zone funds. The building, located at 3619-27 S. State St., was built in 1923 by entrepreneur Anthony Overton, who was “one of the nation’s foremost producers of African-American cosmetics.” The building also housed “the first nationally chartered, African-American-owned bank,” according to information on the city of Chicago’s website. He added that he used the historical account of the building as an instruction tool for a history lesson he provided to school children in the area when he was principal for a day last year. Lucas said the plans for the building when it was under ownership of Mid-South was to serve the public housing residents living across the street from the building. Davis said his organization bid up to $1.2 million to purchase the Overton Hygienic building at an auction after the building went under foreclosure. He said that though his organization hasn’t fully thought out the ultimate end use for the structure, they are going to relocate their offices as part of it and have commercial space on the first floor. Davis added that he was open to hear what ideas the public had for services offered at the building. “We’re still in the development process and the planning process…So, if there is a conversation that needs to be had with Black Metropolis and the rest of the community, then we’re open to that,” he said. In the past 20 years, over 150 American communities have embarked on a path toward possible NHA designation, according to data provided by Elaine Van S. Carmichael, president of Economic Stewardship Inc., and consultant for the Black Metropolis National Heritage Area Project. To date, there are only 27 National Heritage Area designations in 16 states nationwide with more than 45 million Americans living within the boundaries that were passed by the U. S. Congress. The summit concluded with the group talking about their next steps for National Heritage Area designation, which included how to encourage elected leaders in Washington, D.C. to prepare legislation authorizing, instructing and fully funding their NPS suitability/feasibility study.